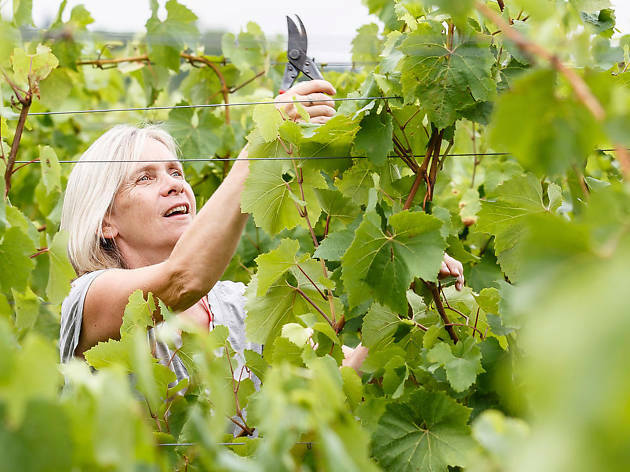 ‘The big problem with starting a vineyard in London was: where do you find ten acres of land? I’d done a wine production course, and got lottery funding, but getting hold of enough space was a major challenge. I phoned around various parks and corporations, and eventually Capel Manor College in Enfield got back to me. They’d decided to let us use land at Forty Hall Farm: two fantastic, south-facing fields at the top of a hill that’s a Jurassic gravel deposit. You can see Canary Wharf and The Shard, yet it feels really rural. We started as a community food project, but volunteers soon started saying “I’ve never felt better than when I’m at the vineyard.” So I got support from the Ecominds programme – run by the Big Lottery Fund and Mind – to run a pilot: does working outdoors on a meaningful job with a nice bunch of people make you feel better? On a personal level, I knew it did. I used to work with HIV and Aids sufferers in the very early days when there was an awful lot of death and bereavement, and I suffered a burnout from that. At the time, I had moved somewhere with a small garden that was completely overgrown. I spent three or four months digging it over, and that made me feel so much better. According to the evidence, which has been rigorously looked at by Mind, outcomes for ecotherapy are as good as for drug and talking therapy. We now have ecotherapists at our volunteer sessions, who are really just there to be a listening ear. There are no specific talking groups or one-to-one therapy sessions: the therapeutic benefit is gained through doing the work, and people can choose to talk about what’s going on in their lives or not. You can’t tell who’s there specifically for ecotherapy and who just wanted to fill some spare time. Working at the vineyard is an avenue for people who have been isolated to get back in the swing of socialising: the tea break is crucial! We sell wine to fund that social mission. We work with a really good natural winemaker and look at the whole supply chain in terms of sustainability. It’s also a key USP for us that we can put London on the label. The Romans brought vines here, and before Henry VIII dissolved the monasteries, all the abbeys would have had small vineyards connected to them. So there’s definitely been winemaking on this scale in London before, but not for a long time. People have an idyllic view of what running a vineyard is going to be like, but it’s bloody hard work. You’re at the mercy of the elements. We’ve had a couple of tricky years with weather. We’re also fairly philosophical that we’re going to lose some grapes to birds. And keeping on top of the weeds is always difficult – though that has got easier as our volunteer group has grown.